Whether you are an artist, a photographer or a creative willing to showcase your works, you won’t go without a portfolio website. The question is: how can you get the one, if you don’t wish to hire a web designer and invest into complex projects? This is where a website builder will come in handy to you! Website builders are the simplest and the most convenient tools you can use to create a portfolio website in a couple of hours only. They come with a variety of functions, features and built-in tools that allow for quick and convenient website customization. This is their major advantage over other web building services. Portfolios created with website builders do not only look professionally, but they are also characterized by powerful functionality. What’s more, these systems are affordable and easy to use, which makes them a smart choice for non-techies, who don’t have the notion of website building. So, if you need a nice and appealing portfolio to showcase your works and attract the attention of the target audience, you will hardly find a better solution than this one. Which website builder will work best for this very purpose? Let’s discuss that further. Portfolios are websites that come with specific niche characteristics and, thus, require special approach to the development process. Modern website builders are designed for non-techies, who don’t often have a single idea of how to get a website running and manage it in future. They come with specific features a portfolio should have to present your works to the advantage. Let’s have a closer look at some of them now. Whatever creative area you work in, you will always find specialized niche templates portfolio website builders offer. The services put you in charge of the web design process. They make it possible to update and manage your portfolio each time you consider it necessary. This is how you can make a positive impression upon your potential clients and fans. By using portfolio website builders, you can promote your works via integrating social media contacts into your project so that your clients and employers could browse your works and find your info. Impressive Portfolio Template Library – Wix offers one of the most extensive collections of designer-made templates, which includes a portfolio section with dozens of mobile-ready themes for graphic designers, photographers, resumes, illustrators, business consultants, artists, journalists, musicians, art directors, interior designers, actors, stylists, models and what not. Blogging – The website builder allows adding a blog to your portfolio website, which enables you to stay in touch with clients, sharing your ideas, news, events and work updates. Slideshows and Galleries – With Wix, you can upload your photos and videos into galleries and create slideshows to attract user attention from the very first sight. HD Video Hosting – Wix allows you to showcase your talent by incorporating your Vimeo and YouTube videos (if any) into the newly created portfolio to tell your story and share news or upcoming events in the unique, fun and extraordinary way. Wix is an all-in-one drag-and-drop website builder you can effectively use to launch a portfolio website. With an impressive niche template gallery, exquisite designs, abundance of specialized apps and widgets, powerful customization tools and other features, Wix has certainly something special to let you present your works to the advantage. Template Choice – uKit offers a nice gallery of pre-designed portfolio templates, which are responsive by default and 100% customizable to make your project stand out from the crowd (you can switch the themes during the web design process). Social Media Promotion – Integration with social media accounts allows publishing your posts and portfolio updates to share with your clients and subscribers at Facebook, Twitter, Instagram and other social accounts. Blogging Option – By adding a blog to your portfolio, you will be able to write posts, recent events and updates, new portfolio items to keep your clients aware of everything that is going on in your career. Temporary Website Management Rights – If you plan to work on your portfolio website development in cooperation with a co-partner, for example, you can share the access rights with everyone, who will update the portfolio together with you. uKit is a reliable and professional website builder, which deserves to be considered one of the best services to launch quality portfolio websites from scratch. Due to the drag-and-drop functionality of the service, ease of use, convenience and intuitive dashboard, the system is a great choice even for people with no coding skills and web design expertise at all. Selection of Portfolio Pages – Squarespace Style Editor allows choosing between several page types to be included into your portfolio, namely Cover Pages, Product Pages, Galleries, Blog Pages, Events Pages etc. Niche Widgets and Add-Ons – You can select and integrate specific add-ons and widgets to boost your portfolio performance, including those for photo and image galleries, social media buttons, integrated statistics collection tools, Contact Form Builder etc. Professional Portfolio Themes – The website builder has a separate section of professional portfolio templates that are 100% customizable and responsive. Cover Page Builder – The system lets you create an appealing cover page, selecting suitable blocks, colors, media files, images, posts and other content (all in all, there are 29 website layouts here). Squarespace is a nice web building alternative to Wix and uKit, but it’s is also more difficult to explore. 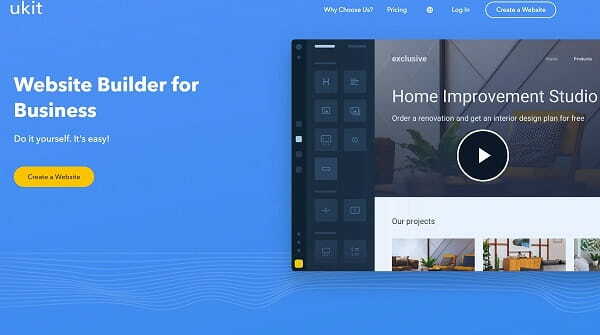 The website builder covers a rich spectrum of portfolio web building needs and offers a nice selection of features to give your project appealing design and decent functionality. Portfolio Website Templates – Whether you need a simple photo gallery or a classy full-featured portfolio, you will certainly find a worthy template to come up to your needs. Retina Support – The system automatically identifies hi-res screens, which ensures that all your galleries and photos will have great look when watched on Retina devices. Mobile View – When creating your portfolio, you can select optimized fonts and make the required settings to provide the best mobile browsing experience for website visitors. Rich Choice of Free Fonts – Allyou partners with Typekit to provide users with an extensive selection of free fonts (there are more than 1000 of them here). Third-Party Integrations – To present your works to the advantage, you can embed content from third-party services like YouTube, Vimeo, Issuu, SoundCloud etc. If you need a nice portfolio website, then you may consider using Allyou. This is a specialized niche service, which comes with portfolio-specific features that cover your web building needs and ensure worthy result. Easy Control – It is you, who are in charge of the web design process, being able to create/edit any content type without using any coding skills. Hosting and Domain Included – The website builder comes with integrated hosting and domain name to save your time and effort, when making your portfolio available on the web. Different Types of Pages – With Portfoliobox, you can create and manage any types of pages, including Blogs, Instagram Pages, Galleries, Videos, Multipages, Parallax Pages etc. eCommerce Option -The platform lets you sell your works of art by integrating and managing online stores. Mobile Optimization – Portfoliobox websites have built-in support for all types of desktop and mobile devices. Powerful Marketing Tools – The service features decent SEO optimization options, social media integration tools, statistics collection features etc. “Find Creatives” Integration – You can connect your Portfoliobox account with “Find Creatives” – a platform that lets you market your works and talent, connecting with clients from any location. Portfoliobox is a nice solution for those, who need a decent portfolio website. Offering plenty of web design options, portfolio features, customization tools, marketing and promotion services, the website builder is certainly worth the attention. A website builder is a great solution, when it comes to portfolio creation. These services are simple and powerful at a time. This is what makes them a decent choice for users with diverse web design background and intentions. By using a quality website builder, you can reach several goals – get a portfolio of your works or services, present them to the target audience, market and sell the products etc. 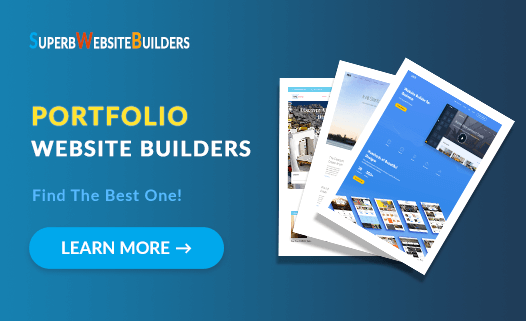 Wix is the best portfolio website builder, which stands out from the crowd due to its extensive portfolio design features, rich template collection, promotion and marketing tools. uKit is a drag-and-drop website builder, which ensures exceptional ease-of-use, convenience, functionality and efficacy of the portfolio web building process. Squarespace – is a cloud website builder, the feature set of which is enough to launch a standard portfolio with good functional characteristics. Better suits for professionals. Allyou is a specialized portfolio website builder, which provides a collection of niche-related tools, integration options, responsive themes and social media marketing opportunities. Portfoliobox is another online portfolio website builder, which lets you focus on the web creation process and guarantees decent result via the application of web design tools. It certainly takes time and effort to design a portfolio website, but if you are fortunate to select the right web building tool, this process won’t be a challenge for you. Reviewed above are the best portfolio website builders, which are worth the attention of any creative, who intends to publish a portfolio of his/her works. Take your time to test each of these services to finally select the one, which fits your needs most of all.